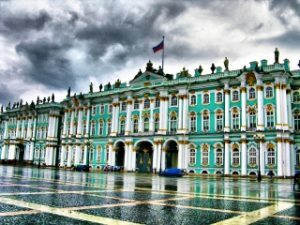 The State Hermitage museum proudly demands to be one of the oldest and largest museums in the world. It was founded in 1764 by Catherine the Great, and is opened to the public since 1852. The museum consists of 5 historical buildings, including the Winter Palace – the former residence of Russian tsars. The buildings of the museum, by themselves, are true architectural masterpieces. The Hermitage collections numbers to more than 3 millions of items – from prehistorical to modern times, including the largest collection of paintings in the world. The museum owns a great number of Italian Renaissance and French Impressionist paintings, as well as outstanding collections of works by Rembrandt, Picasso, and Matisse. Visitors may also take advantage of the excellent collection of Egyptian, Greek and Roman antiquities, exhibits of Siberian and Central Asian art. Visit to the State Hermitage is undoubtedly the main excursion, that has to be done, during the visit to Saint-Petersburg. The Treasure Gallery of the State Hermitage is one of the most interesting collections of the museum. It has got its name in the 18th century, during the reign of Catherine the Great. The Gallery consists of two sections – so-called Gold Rooms and the Diamond Rooms. The Gold Rooms collection consists of around 1,500 works, made from gold and dating from the 7th century B.C. to the 19th century A.D. The Gold Rooms gallery offers the Scythian works from the 7th-4th centuries B.C., Greek jewellery from 4th century B.C., antiquities from the Time of great migration, and also, items from Byzantium, Early Russia and medieval Europe. This excursion is not available on Mondays (museum day-off).